For the past five years, Modern Tribe has been proud to lend support to the WordPress and nonprofit communities through our Nonprofit Partnership Program. This program provides free licensing for Events Calendar PRO or Event Tickets Plus to qualifying nonprofits, allowing organizations ready access to premium tools that make it easier to promote their events, generate revenue for charitable causes, and otherwise do good work. Our program has undergone a number of changes in the half-decade since its inception, and in that time, we’ve received applications from thousands of nonprofit organizations interested in working with our products. We couldn’t be more thrilled to see the many ways that these organizations are benefitting from the use of our plugins. When advocating for wildlife conservation and sustainable living is your aim, sometimes it pays to think small. The brainchild of wildlife educators Stephanie Arne and Tim Davison, Creative Animal Foundation is a 501(c)3 organization dedicated to promoting global conservation and the protection of animal species, natural habitats, and our oceans and waterways. The embodiment of their nonprofit’s mission and their passion for sustainability comes in the form of Arne and Davison’s spectacular tiny home on wheels–a traveling installation of sorts that’s equal parts home, office, studio, and museum exhibit. To date, Arne and Davison have invited over 15,000 people from all walks of life into their home, sparking conversations and opening minds to new possibilities in the realm of low-impact, environmentally-conscious living. And with at least 50 stops planned for their 2017 tour, there’s still ample opportunity to join in on the fun! 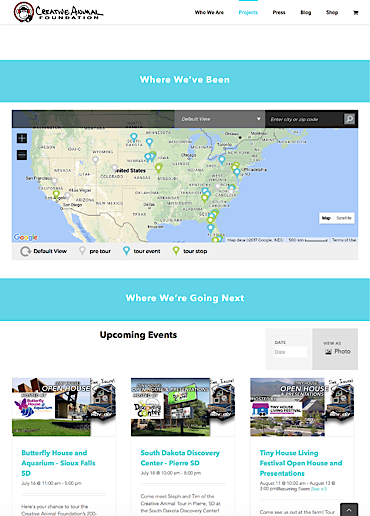 Visitors can see past destinations, check out upcoming tour dates, and even suggest next stops from the Creative Animal Tour page. A custom implementation of Events Calendar PRO blends beautifully with the site’s theme, and we’re loving the use of PRO’s shortcode functionality to nest a full calendar view comfortably amid other page elements. This is a great example of how Events Calendar PRO can integrate seamlessly into existing site content–a simple setup is all that’s needed to produce a terrific result! There’s plenty more great content to enjoy over on the foundation’s website, including video tours, regular blog updates, and even an online shop. Head on over to creativeanimal.org to see the rest of it, and don’t forget to check out the Creative Animal Tour when they’re in your neck of the woods!